Anyway, I want to document what I did for the turkey since it was my first ever, and I am told that it was good. Place the turkey in a large pot. Pour enough cold water on top to cover it. Dump in everything else, and give a bit of a stir. Store in the refrigerator overnight. When ready to cook, remove the turkey from the pot and pat it dry. Preheat the oven to 400 degrees. 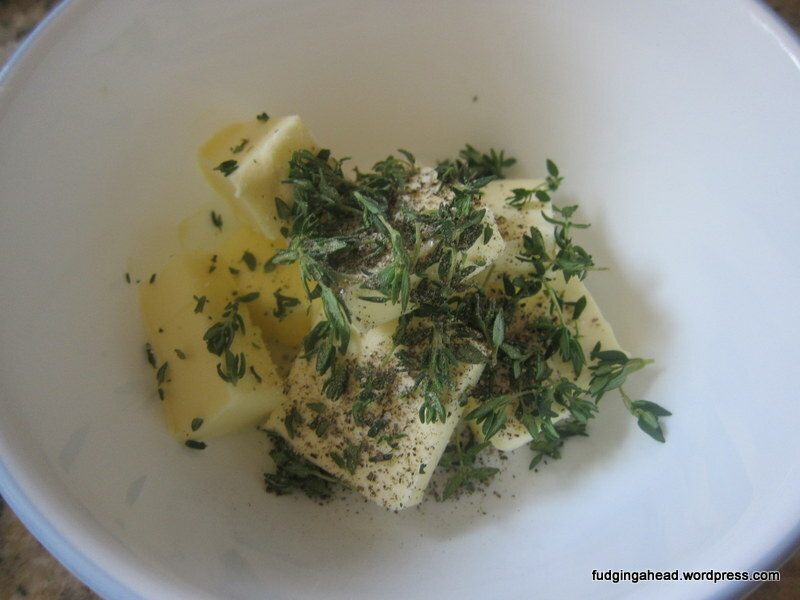 Mix together the thyme, butter, salt, and pepper. 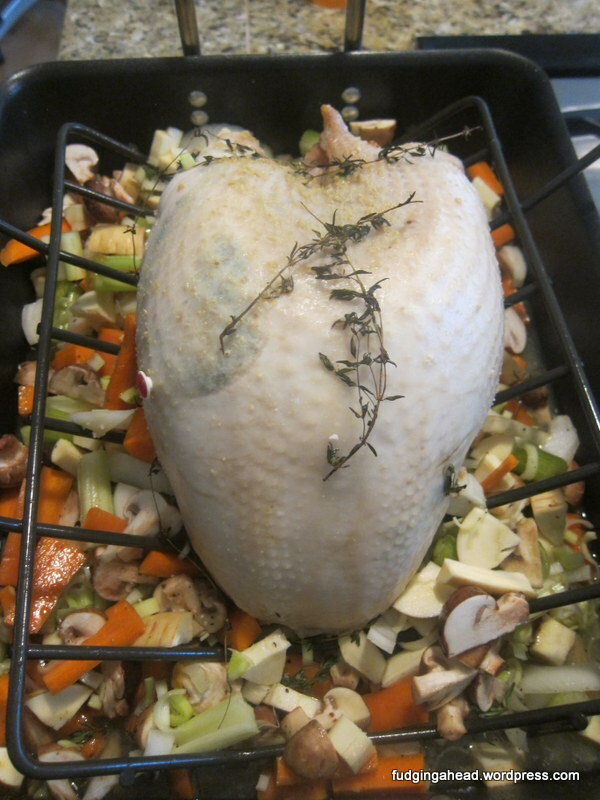 Place the turkey on a rack in a roasting pan. Rub the butter mixture under the skin of the turkey, and over the outside. Stir together the lemon juice, wine, and garlic. Pour over the top of the turkey. Rub the outside of the turkey with a little oil. 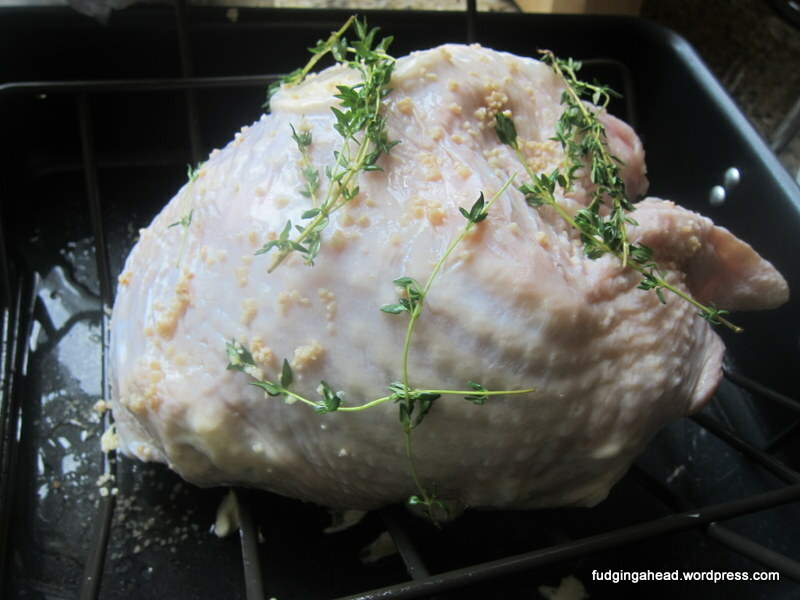 Place the twigs of thyme on top. Bake for 20 minutes. Lower the temperature to 325 degrees. Add vegetables to the pan. Feel free to season them as you wish. 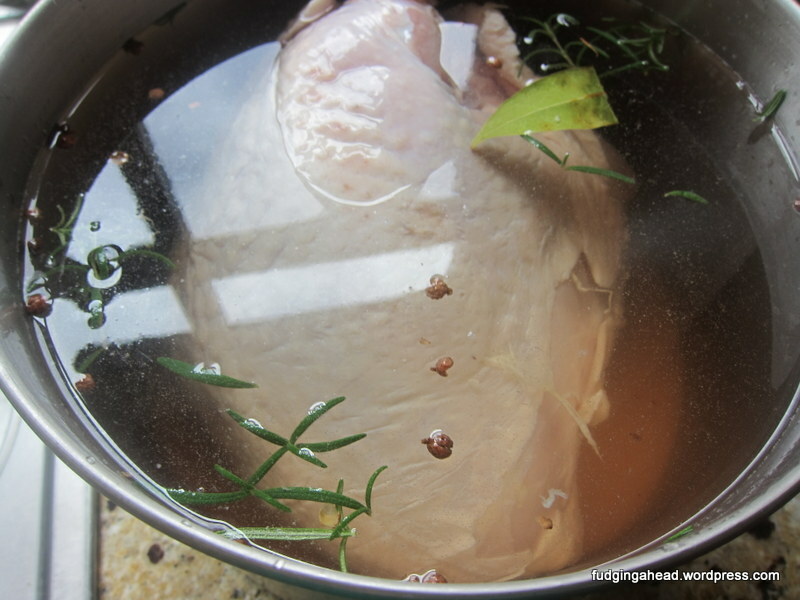 Then, add 1 cup chicken broth, pouring over the turkey, and some more water. Bake for about 2 hours until the turkey is cooked through. 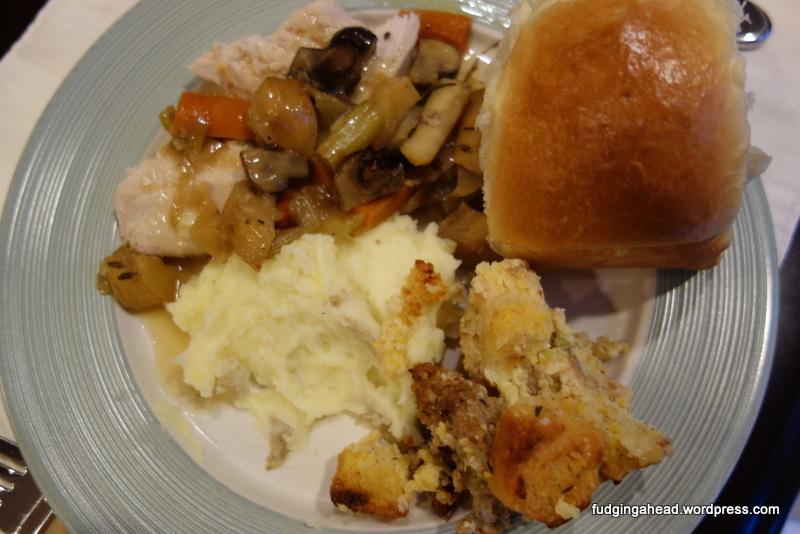 While the turkey cooks, every 20-30 minutes, take a spoon and get some liquid from the pan and spoon it over the turkey. Stir together the flour and wine until smooth. 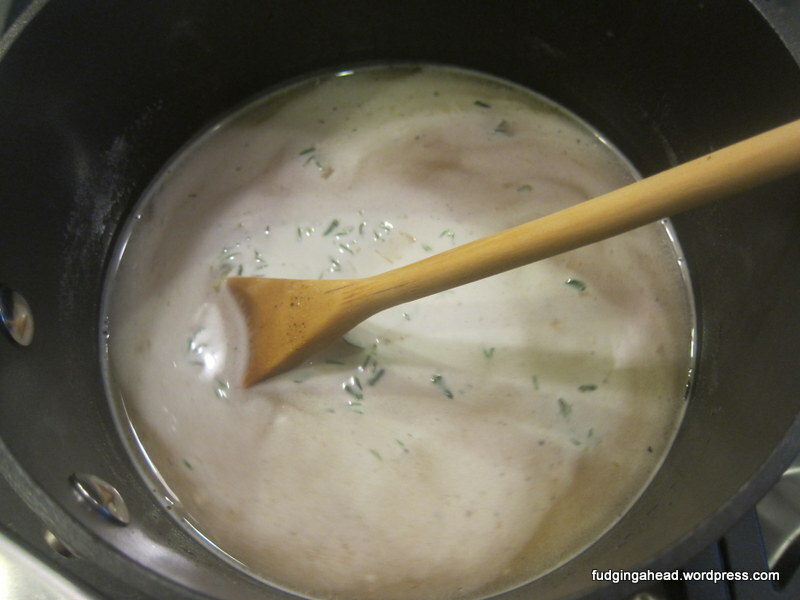 In a medium saucepan, mix together the pan liquid, wine and flour mixture, and thyme. Add salt and pepper to taste. Bring to a simmer, and cook for about 10 minutes or until thick enough for you. 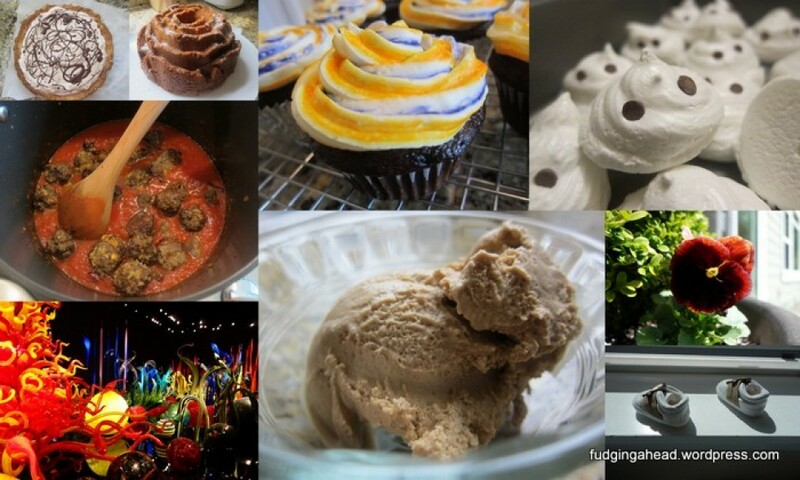 ← Topic-Changing Thursdays: The Fudgelet is 5 Months Old! You give me confidence to try this! 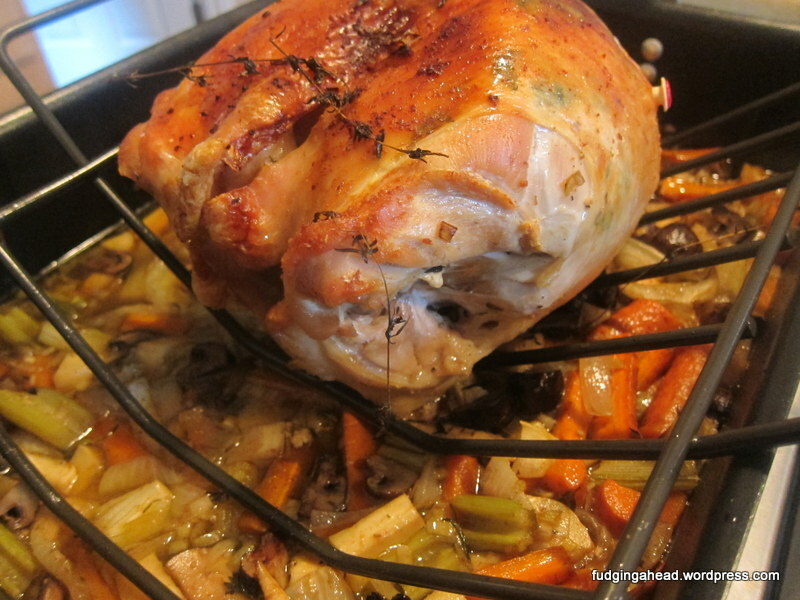 If you have done a roast chicken before, you can do it!